My name is Waikani Anne a Congolese refugee residing in Malembo C. I arrived in Kyangwali refugee settlement in December 2017, it was my first time to stay in a refugee settlement and fresh as was I did not know any laws of Uganda and even I did not know where to report in case I experienced gender based violence. We were settled in Malembo C near river Ngusi where one could hardly get any service like medical care, water and sanitation, education for my children and no proper channels for reporting sexual gender based violence. In April 2018, KRC with support from CARE International ,recruited volunteers from Malembo C and I was among them, at first I was hesitant to join but since I did not have any job to occupy me I decided to join as a volunteer. One of my main activities was to mobilize the community every time there a community awareness meeting in Malembo c. I did my work so diligently and won respect from my people. 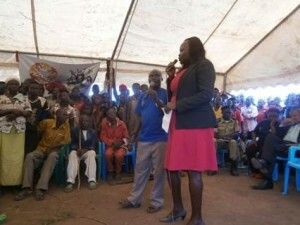 As this continued, I realized that I and other volunteers could do much more on issues of community awareness on GBV. We decided to form a local drama group called Malembo C drama group. 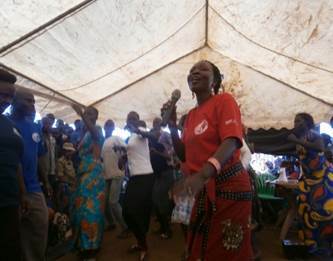 With the help from KRC we composed songs on gender based violence and how to reduce violence against women and girls. We were supported in this and started moving from one place to another and this has made us popular. Being Congolese my colleagues knew how to play instruments and this made our music more attractive and pleasant to the listeners. My drama group has gained popularity in Kyangwali refugee settlement that we performed even on the World refugee day. Besides raising awareness on GBV through music and drama, we have started earn some income from our drama activities and hope to intensify on this as an alternative source of income to support our families. We are also planning to start a village Savings and Loan Association in the near future. My name is Magezi Dhenyi. I am Congolese refugee who arrived in Uganda in February 2014. When I reached in Uganda I labored to learn the local languages of Uganda which has made me popular in the Kyangwali refugee settlement. I worked with KRC under the livelihood project and one of my main activities was to mobilize the community every time there a community awareness for farmers. I did my work with commitment and won respect and popularity from my people. In April 2018 when KRC started implementing the Humanitarian GBV project in Kavule and Malembo C among the newly settled refugees from DRC, I was recruited to become an interpreter This was a big advantage to me as i was integrated in all project activities. The villages are predominantly occupied by Bagegere that speak kigegere which is my mother language, I accepted the offer and I have been instrumental in translating from English to Kigegere during awareness sessions on GBV, mobile complaint handling clinics where different stakeholder are brought on board and during mediation of cases. The most significant event in my life was when I was asked to interpret Kigegere on the local radio the first of its kind on Ugandan radio stations. This made me proud and because of speaking the language it attracted my fellow countrymen to listen to the radio programs which wasn’t the case before. A lot has changed within especially understanding of GBV issues and quick response to them. My name is Richard Mugavu am a Congolese refugee residing in Malembo C. I arrived in Kyangwali refugee settlement in December 2017, I had never stayed in a refugee settlement I only knew only the laws of Congo , and I had no idea about the laws of Uganda and even where to report in case I or a member of the community experienced sexual gender based violence. I was among those refugees who were settled in Malembo C where one could hardly get better social services like medical care, water and sanitation, education for children, there was no proper channels for reporting sexual gender based violence. By time we settled here, the rate of crimes were so high due to boredom and less knowledge on the laws of Uganda, more to that life was so difficult for us and our children because earning a coin to support the dry grains of maize which we were being given was not easy. My children hardly ate the hard grains of maize, posho and beans that was distributed by world food program, life was so hard I even thought of going back to Congo at one time. In April 2018, when KRC with support from CARE International selected me as a volunteer from Malembo C, I was among the first and a leader of the rest of the members. One of my main role was to mobilize and organize the volunteers to actively participate in gender based violence prevention and response work. When KRC looked for a drama group to work with, I decided to organize my fellow volunteers and other community members and we formed a local drama group called Malembo C drama group. Being Congolese, i knew how to play instruments and this made our music more attractive and pleasant to the listeners. With the help from KRC we composed 3 songs on stopping early marriage for children below 18 and how violent it is to sell food in the household, it violets the rights of the children. The other song is about respect of the laws of Uganda by not committing crimes because once found one will end up in prison and the third song is about where to get information on sexual and gender based violence go to Margret, Alice and Mubarak of KRC they will give you all the support that is needed. 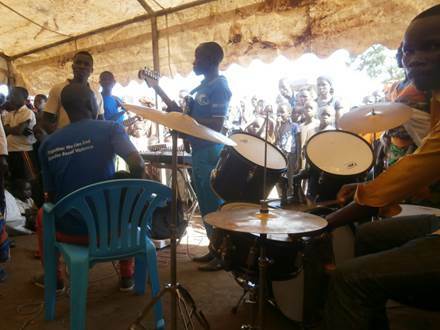 This drama group has become popular to an extent that we also perfume in other areas like Maratatu, Kavule and other neighboring villages in Kyangwali refugee settlement. The drama is now acting as a source of income where i get some money after performing that helps me to buy some food such as meat, fish and milk to support the posho and beans that we receive from distribution points which was not the case before, The drama has also helped to engage the youths as well as change their life styles on avoiding crimes. 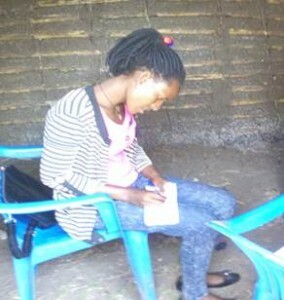 My name is Kyalisiima Frankline am 28 years old and a midwife at Kyangwali health center IV, for the last three years I have worked in this health centre, I had never seen organization that provide out reaches services like KRC yet it does not implement health projects . You can imagine even those implementing health projects do not go deep in the host community to provide services that KRC renders during mobile complaint handling clinics. A number of clients from the host community have come testifying to have been sensitized during the mobile complaint handling clinic especially women from the host community who never used to come for antenatal are now coming and the number of birth from the health centre for the host community has increased which previously was low. Formally women would produce from the villages being attended to by traditional birth attendants. Our health facility records currently show women from the host community being sensitized by KRC to always attend antenatal and deliver at health facility.